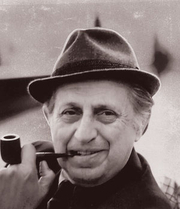 Leo Rosten was born in Łódź, Poland, and emigrated to the USA at age three, settling in Chicago. He graduated from the University of Chicago in 1930 and earned a Ph.D. in 1937, followed by postgraduate study at the London School of Economics. During the Great Depression, he worked as a screenwriter and held a series of government information jobs during World War II. In 1949, he joined the staff of Look magazine, where he worked until 1971. As Leonard Q. Ross, he began his publishing career with the novel The Education of H*Y*M*A*N K*A*P*L*A*N (1937), based on his experiences teaching English to new immigrants. He edited a series of articles for Look that became the basis of A Guide to the Religions of America (1955) and The Story Behind the Painting (1962). Rosten enjoyed instant success with The Joys of Yiddish (1968), a comic lexicon that introduced millions of Americans to Yiddish words and idioms such as chutzpah and nosh that are now widely used. He followed it with The Joys of Yinglish (1989). He produced dozens of other works over more than 60 years of writing. Leo Rosten's book Seizing Control, Black Shamrocks MC Book One was available from LibraryThing Member Giveaway. Leo Rosten is currently considered a "single author." If one or more works are by a distinct, homonymous authors, go ahead and split the author. Leo Rosten is composed of 19 names. You can examine and separate out names.